This is our flagship orchestra. Children usually will have achieved Grade 7 to 8 on their violin and Grade 6 on violas or cellos to take part. We play some very challenging repertoire including works specially written for us, therefore personal practice outside of YMC is certainly necessary. This orchestra (for string and wind players) we aim to work on more advanced repertoire and therefore Grade 6 is expected from violinists and a good Grade 5 violists and cellists. Some of the repertoire includes wind players and members of the advanced wind ensemble (grade 6 and above) take part in this orchestra on an occasional basis. Practice parts are given and it is of great benefit if students could look at them during the week beforehand. Some might need to take their music to their teachers for a little extra help. This is a string orchestra made up of children who are usually about grade 5 standard on violin and viola and grade 4 on cello. By this stage they should have a good degree of instrumental knowledge in all the requirements for those grades. This is an orchestra for string and wind players mostly made up of children around the ages of 8-11 and the standard of playing ranges from children who have a good working knowledge of 3rd position i.e. grades 3-4 on the violin or viola and the cellists should be grade 3 upwards. Wind players should be grade 3 upwards. The Choir enables all children from eight upwards to sing together. It includes both Kodály and voice training and older children are given some special repertoire. Regular concerts are given by the Choir and the director will encourage solo performance by singers. 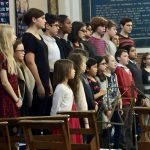 The choir aims to be a centre of excellence for young singers and is suitable for all students who wish to develop their vocal skills further. The class combines the Kodaly method, a system of corresponding syllable names and hand-signs to represent the intervalic relationship between the notes of any key, and rhythm syllables to express the duration of the note values and the Orff method, a child-centered approach which combines music, movement, drama and speech incorporating the use of small musical instruments and inviting improvisation. Special attention is given to inner hearing, memorising, co-ordination and expressivity. These ensembles are smaller chamber groups (3 -8 players) of students from the same orchestra coached by one of our specialist teachers. Children who wish to join one of these ensembles will be put into groups according to their age, ability and space availability. 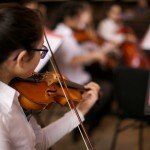 String ensembles are available for children from the Preparatory First Orchestra standard and above. An assessment is required to be part of any ensemble. 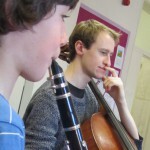 Chamber music or ensemble playing is a vital part of a child’s musical education. 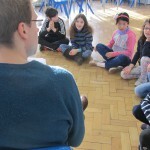 It is music making without a conductor and gives students the crucial skills of listening and communicating with other players. With the help of their chamber music coach, students learn the craft and skill of holding a tempo or pulse and adapting intonation and style of playing to their fellow musicians. Children who join a YMC ensemble will stay with this group for the entire academic year and will have the opportunity to perform in various national festivals in that formation. YMC ensembles have been first prize winners in the North London and Spring Grove festivals for many years. The wind ensembles are aimed at players of all woodwind instruments of grade 3+ standard to give them a gentle introduction to the necessary art and enjoyment of ensemble playing. It should provide them with a solid base for future participation in orchestras and chamber music. Players of the different wind ensembles can either join the prep first orchestra (from approximately grade 3 upwards) or the Junior orchestra (from approximately grade 6 upwards). 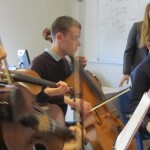 Chamber music or ensemble playing is a vital part of a child’s musical education. It is music making without a conductor and gives students the crucial skills of listening and communicating with each other. With the help of their chamber music coach students learn the craft of holding a tempo or pulse and adapting intonation and style of playing to their fellow musicians. These classes train general aural skills and voice production which is a good support for the preparation for aural tests in national grade exams. Children from 7 upwards are grouped roughly by age and experience and the classes will develop their musical skill of pitch, rhythm, intervals and mental and physical coordination. The classes are also suitable for those who simply wish to develop their vocal skills. In addition, we would highly recommend these classes to all instrumentalists in order to develop a strong sense of pitch and rhythm, two indispensable tools for instrumental playing. These are different small group classes (2 – 6 players) for beginner to advanced recorder players. Beginner classes are for players aged 5 upwards and all other group classes are arranged after consultation with the class teacher. 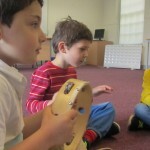 Children learn technical skills of recorder playing in a warm and positive group environment. Many students take regular grade exams.